Like most high end coolers on the market the RollR cooler is rotomolded. The Plastic Professionals, explain the process this way “Rotational Molding, also called rotomolding or rotocast, is a thermoplastic process for producing hollow parts by placing powder or liquid resin into a hollow mold and then rotating that tool bi-axially in an oven until the resin melts and coats the inside of the mold cavity. 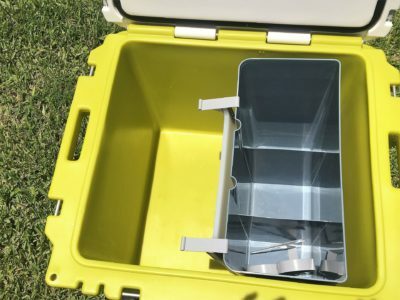 Next the tool is cooled and the part is removed from the mold.” Basically, it allows the company to create a durable cooler with thick insulation. The RollR 85 also features 9” all terrain rubber tires, aluminum pull handle with dual motorcross style grip, non-skid rubber feet, rubber latches, and an Airtight gasket. 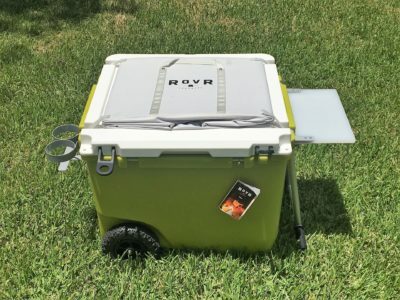 The RollR 85 also features a plastic cutting board attachment, cup holder attachment, and a deep freeze dry bin to keep food and drinks cold but separated from the ice in the cooler. The deep freeze dry bin is held in place by a small one inch square of Velcro. RollR 85 dry bin installed in the cooler. 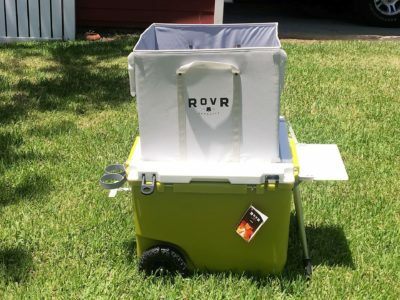 According to ROVR Products, the RollR 85 will hold 125 cans and 20 pounds of ice without the deep freeze dry bin, and 88 cans and 10 pounds of ice with the deep freeze dry bin installed. 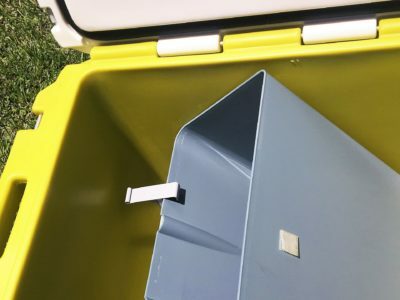 Another feature that sets the RollR apart from others is the removable wagon bin which allows the user to carry picnic and camping accessories and the cooler at the same time. It also folds flat to make a comfortable seat. RollR 85 with the cutting board and cup holders installed. Finally the RollR is certified grizzly bear resistant. Throw a lock on the lid and body attachment points to keep out bears or other unexpected guests. The outside dimensions of the cooler are about 2 feet in every direction. So it is a pretty large cooler, but the wheels and aluminum handle make it is easy to maneuver. However, I feel like it is too large for me to lift by myself. I used the cooler on a test run on a trip to Pensacola from New Orleans. Temperatures were in excess of 90F for the entire trip and it was stored in the back of my truck which is enclosed except at night when I brought it in to the hotel room with us. I started out with water bottles, soda cans and some Gatorade in the main body and a couple bottles of booze and P3 Protein Packs in the deep freeze dry bin. I started out with all the above stuff and two bags of ice. The cooler had been left outside before the trip. The two bags of ice lasted most of the day with significant melting, but there was plenty of ice for me to make whiskey and cokes that evening. By the next morning, there was more water than ice and the water kept causing the deep freeze dry bin Velcro to detach from the side of the cooler. I drained off some of the water and added another 15 pounds of ice and we headed to Pensacola Beach for the day. This kept everything cold all day and there was ice at the end of the day for more drinks in the evening. However, there was quite a bit that melted off. I did not replace the ice in the cooler and on Monday I still had cold drinks in the cooler but no ice remaining. The water had also caused the deep freeze dry bin to detach again and this time it pulled the Velcro off of the side of the cooler. Not sure what happened but the Velcro adhesive has lost its stickiness. I will probably try and repair it with super glue. There are several criteria I will be using as I evaluate the RollR 85 over the next couple of months. The first is ice retention. 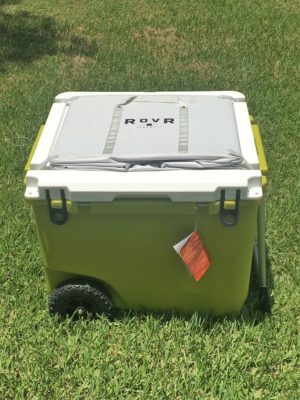 ROVR Products claims it will hold ice for 10 days depending on use. This probably includes the recommendation to sacrifice a bag of ice to cool down the RollR prior to actually using it. I will also be looking at the durability of the cooler and its components as well as the functionality of the accessories. Are the actually functional or just an added expense? This concludes my initial report. Thanks for reading and check back in about a month for my update. Thank you to 4alloutdoors.org and ROVR Products for supplying the product for this review.